When the steel door opens, a 72- year-old man with dyed black hair steps out into the new world. He has spent 28 years behind these walls, for taking all the heat that resulted from a botched holdup in which the big boss' only son was killed, and for which he was responsible. We know he's a man who lives in a world where each has a debt to be paid. When the steel door opens, a 72- year-old man with dyed black hair steps out into the new world. He has spent 28 years behind these walls, for taking all the heat that resulted from a botched holdup in which the big boss’ only son was killed, and for which he was responsible. We know he’s a man who lives in a world where each has a debt to be paid. Val is a short man with a goatee and a prison haircut, looking for all the world like a barber who lost his shop in the recession. He walks the careful shuffle of a man accustomed to narrow iron hallways, and who must now navigate the uncertainties of public sidewalks. His name is Valentine, but we know he is Al Pacino. Val has an old friend waiting for him. His name is Doc, and he has dead eyes that have seen too much death. He has the pallor of a man who avoids the sun, and his suit hangs on him giving him the look of a defrocked priest who misses the collar and the certainty that came with it. He is Doc, but we know he is Christopher Walken. Doc carries a gun. Doc too, has a debt he must pay, an unpleasant one that will keep him alive for a few more years. These two men, we will learn, were once partners in thievery, cheap heists and pay to go murder. Now they are old, and they face each other here like two old high school champs who lost the final game ball. We knew at the outset, by way of crackling obscene phone calls from a mobster named Clapphands, that Doc’s job is to extend one hand, and with the other, take a life. We wait for that moment. In the meantime, we will walk this day through from twilight to the ugly grayness of the next morning with these two old friends, who like Vladimir and Estragon from “Waiting For Godot,” will entertain, bore and shock us with long discussions of motive, of ancient mistakes and ugly honesty. This is what you will get for your money: An hilarious coming out visit to a brothel run by the daughter of an madam who, once upon a time, knew their flesh and dreams. She is Judy Punch, and she is a comic dream. There will be a drug store break in for Viagra, and another in a men’s shop for a new suit for Val. Doc takes him along each step that awakens in both the old love and admiration they once held for each other. But the gun in Doc’s waistband is always there, and in Val’s heart, is the knowledge that their journey is coming to an end. There will be a stolen car, sleek and cool, owned by powerful mobsters, that will take our heroes on a rescue mission to pickup the last of their ancient trio, a man named Hirsch, who is dying in a nursing home. 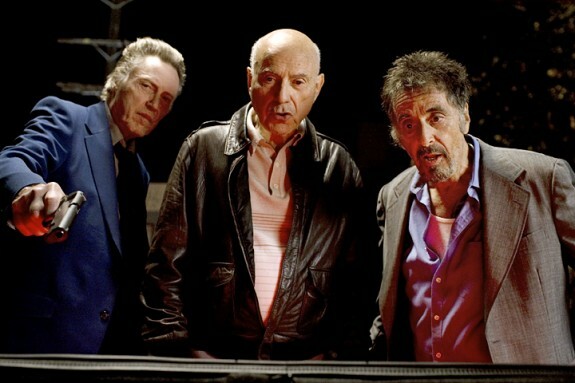 We know at once that this is Alan Arkin, who is more suited for this role than anyone. Hirsch was once the get-away driver, and he will now once again, take the wheel and speed off into the long night. We will follow them and the multi-police cruisers on a breathtaking chase. We can tell you about the naked girl in the trunk of this car, and that will lead to some interesting action, blood and a short burst of justifiable revenge. There will be a baseball bat, and there will be blood. Stuck in the middle of this muck and mire, there is a moment of magic, one I’m sure wasn’t scripted, and one which Pacino knew was coming and loved. In a night club, Val approaches a trio of uptown girls out slumming. They sniff at this creature, but he bribes the disc jockey to play an oldie but goodie slow dance. The sweetest of the girls accepts the dance. While they hold one another like people once did, and float through the candy-colored lights, the dance becomes magical. She folds into Val’s arms, and we see a ballet of nostalgia, slow and sweet, soft and gentle. When the camera focuses on the girl’s face, we realize she is an eerie replay of the doomed young Sicilian girl Michael Coreleone married a century ago. The hour of reckoning will come in a big all-out moment on the streets of this unknown city. It will be loud and shaky and without need. “Stand Up Guys” is not a very good movie, simply, at times, an interesting one. Noah Haidle’s script lacks power, and Fisher Stevens, as a director, needs more time to develop muscle. But it has the sorcery of this brilliant trio of players, three shamans of film, who despite this inadequate material, still have the power and gifts to hold our attention, and if only for an hour or two, remind us that there is, in Hollywood, magic to be made. J.P. Devine is a former stage and screen actor.